Chile's supreme environmental court has ordered the country's environmental watchdog (SMA) to explain why the sanctions imposed on Barrick Gold (TSX, NYSE: ABX) in relation to environmental violations at the Pascua Lama project were reduced from the original $16 million to $12 million, among other issues. The court resolution follows a complaint filed by indigenous communities, who claim the SMA's resolution on the gold and silver project involved several illegalities, especially in relation to the total penalty imposed to Barrick. According to Diario Financiero (in Spanish), locals’ lawyer Lorenzo Soto argues the total amount should have been higher, as the protocol indicates each violation warrants an individual penalty, rather than, as it was the case, a general one. In an interview with El Dinamo (in Spanish), Soto explained the SMA filed 23 charges against Barrick, which should have been subject to fines of up to $9.4 million each. In his complaint, the lawyer also claims there were further infractions not acknowledged by the SMA. Chile's supreme environmental court has given the SMA 10 days to respond to these accusations. Pascua Lama, which would produce about 800,000 to 850,000 ounces of gold a year in the first full five years of its 25 year life, was scheduled to start production in the second half of 2014. But early this month Barrick said it is now looking at late 2015, which brings higher capital costs and bumps the project cost estimate up as high as $8.5 billion. 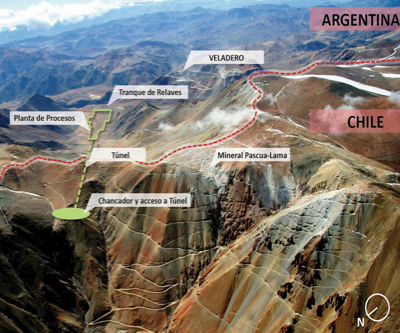 The gold and silver mine straddling the border with Argentina, was set to become one of the top gold and silver mines in Chile, the world's top copper producer.